The Air Implementation Pilot was a project undertaken jointly by the EEA and the European Commission. It was one of two pilot projects (the other one relates to waste management) called for by Environment Commissioner Janez Potočnik at the June 2011 meeting of the EEA Management Board. Both projects sought to explore an enhanced role for the EEA in supporting the implementation of the European Union’s environment policy. Improving the implementation and enforcement of EU environment legislation is one of the Union’s main strategic objectives for the coming years. This objective has been set out in the proposal for the new EU Environment Action Programme to 2020, a Communication from the European Commission, and a related resolution by the European Parliament. There are several reasons for this drive to improve the implementation and enforcement of environment legislation. One reason is that there remain specific gaps in knowledge about the state of the environment. Another is the need to find effective ways of addressing environmental problems once they are identified. While air quality legislation has been in force for almost twenty years, delayed or inadequate implementation means that the objective of achieving “levels of air quality that do not result in unacceptable impacts on, and risks to, human health and the environment” (as stated in the Sixth and Seventh Environmental Action Programmes of the European Union) has not been met. Persistent air quality problems across the EU (mainly exceedances of target or limit values for particulate matter, ozone and nitrogen dioxide) are mostly observed in urban areas. For this reason, it was decided that the Air Implementation Pilot would focus on gaining a better understanding of what cities need in order to better implement EU air quality legislation. The additional knowledge resulting from the Pilot contributed to the review of the EU’s air quality policy performed by the European Commission and its subsequent proposed Clean Air Policy Package. Twelve cities took part in the Pilot: Antwerp, Berlin, Dublin, Madrid, Malmö, Milan, Paris, Ploiesti, Plovdiv, Prague, Vienna, and Vilnius. The selected cities reflected European geographical coverage, city size, and a variety of main pollution sources. 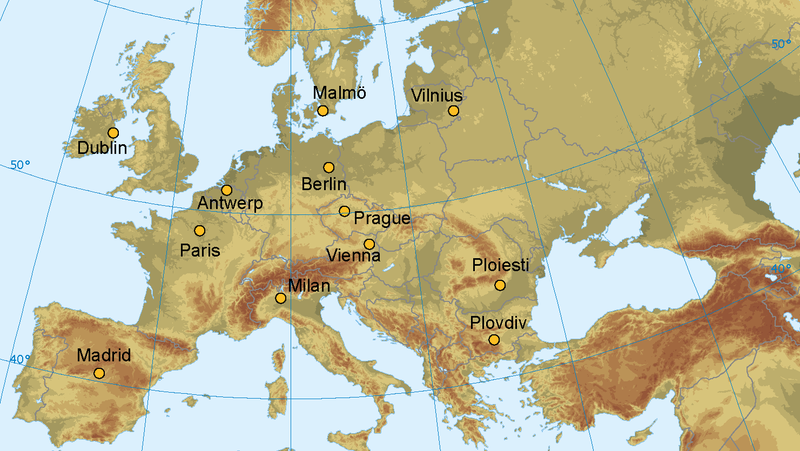 In the map below, the 12 Pilot cities are shown. The Pilot examined five themes in air quality implementation: local emission ‘inventories’ (the measurements of what pollutants are being emitted and where); computer modelling activities to assess how these pollutants disperse in the atmosphere; monitoring networks that measure air quality using monitoring stations based across a city; management practices by city authorities; and public information measures to inform citizens about air quality in their city. The EEA and its European Topic Centre for Air Pollution and Climate Change Mitigation met with representatives from each of the Pilot cities and worked together with them to gain a better understanding of the current performance of the cities in each of these areas. In these meetings, in follow-up analysis and in the resulting reports, the EEA and the cities also examined ways to further improve their performance. The analyses found – not surprisingly – that there are some differences across Europe in the management of urban air quality. Nevertheless, there were a few trends that were shared by several cities. For example, local authorities continue to face problems in terms of air quality assessment (attributing air pollution to the correct sources of pollution), and management (plans and programmes designed to improve air quality). The Pilot also revealed that cities continue to find it difficult to link measures aimed at improving air quality to observed trends in air quality concentrations. Cities also identified areas where they needed additional support and/or were willing to offer their experience to others. These areas include: estimating emissions of pollutants from specific sources (e.g. ‘fugitive’ emissions, wood burning, or the ‘real world’ emissions from vehicles as opposed to their official test-cycle emissions); interpreting and validating the results of computer models of air pollution; deciding where best to site air quality monitoring stations; and implementing measures to improve air quality and assess their effect. The EEA presented a detailed report with final conclusions and recommendations in mid-2013 which contributed to the review of EU air policy. The results from the Air Implementation Pilot were also presented at Green Week 2013 "Cleaner air for all”, the biggest annual conference on European environment policy. For references, please go to https://www.eea.europa.eu/themes/air/activities/the-air-implementation-pilot-project or scan the QR code.